Villa Dunedin is a stunning 4 Bed 3 Bath house which enjoys an elevated position on a corner plot at Glenbrook Resort, located only 8 miles from Disney. 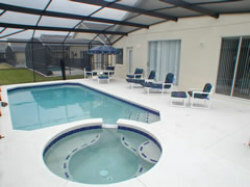 The private pool ( which can be heated at an extra charge )faces S.E. 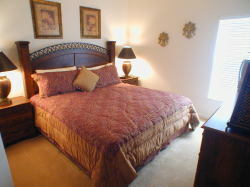 and is adjoined by an executive spa where you can enjoy a luxurious soak. A four feet high privacy screen has been erected around the pool and should you require it there is also a child proof fence which can be erected between the Villa and the Pool/Spa. If you have a baby we have provided a cot, highchair and stroller, free of charge. Older children can enjoy the use of the Playstation 2 and selection of children's books. Relax in the Formal Living Room where there is a portable CD player and a selection of easy listening CD's. Entertain yourselves in the evening by playing one of the various board games which have been provided or enjoy a book from our adult fiction selection. In the Family Room there is a 32 inch T.V., with cable channels, also a VCR, DVD, CD player, Radio and Cassette player. We have recently added a selection of DVD's and videos. All the bedrooms have a TV/DVD combo. Cable T.V. is available throughout the house. In the Villa we have a folder with detailed information which provides a starting point of where to go and what to see in the area. A big plus is the Wal-Mart Super Store which is located about half a mile from Glenbrook, making shopping quick and simple. Balance to be paid - 8 Weeks to arrival.